QX Magazine - 10.04.2019 » Download PDF magazines - Magazines Commumity! 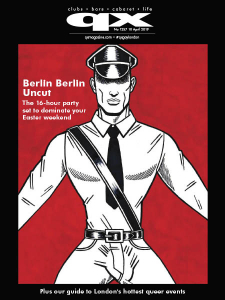 QX Magazine (stylized as qx) also known as QX International is a free gay weekly magazine distributed at most gay bars, gay clubs and other gay venues across London and the UK. The magazine is based in London. As a free magazine, it has a high proportion of advertising space for revenue. The magazine includes news articles, club and bar reviews and back pages that are dominated by adverts for male escorts.